The recovered slippers, known as the “traveling pair,” were stolen from the Judy Garland Museum in the overnight hours of August 27-28, 2005. Despite an investigation by local authorities, which included countless interviews, numerous theories, and even searches of abandoned iron ore pits, the slippers were never located and no arrests were made. The investigation remained a priority for the Grand Rapids Police Department, who requested FBI assistance in 2017 when the extortion plot against the Markel Corporation surfaced. Agents from the Minneapolis Division worked closely with the FBI’s Art Crime Team throughout the investigation, which is ongoing. 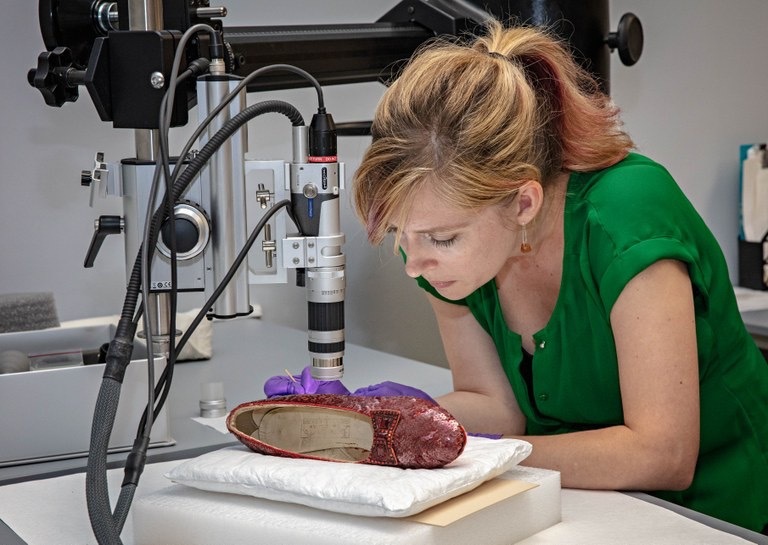 After the recovery in July, the FBI transported the slippers to the Smithsonian’s National Museum of American History in Washington, D.C., where conservators were able to conduct an in-depth examination and analysis, including evidence of wear and details unique to their use in the 1939 film. Examination of the recovered shoes showed that their construction, materials, and wear are consistent with the pair in the museum’s collection, which were donated to the museum by an anonymous donor in 1979.